Just as in 2012, I made fairly detailed records of spending in 2013.These are fairly incomplete records because they do not include expenses taken directly from my paycheck such as health and life insurance. They also do not include expenses paid by my wife such as car insurance. At first glance it looks little different from the 2012 chart. The section labeled Home is a bit larger, the section labeled education has disappeared with the paying off of my student loans, the section labeled food & dining is larger due to my laziness in cooking my own lunches. My spending on food & dining was 13% of my income, about 3% higher than in 2012. 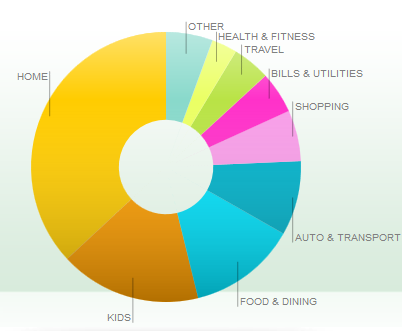 It is even more lopsided towards eating out, with a mere 20% of my food budget going to grocery stores. I finally managed to expel all stores from rewards cards from my top spending list. Once again Sprouts is where I spend most my money. All of these are restaurants close to my work with the exception of La Fuente which was a hole in the wall Mexican place I was trying, and failed, to keep in business. The most notable change was that I pushed the chains In-N-Out and Panda express out of the top five. I spent 9% of my income on my vehicle. This is pretty appalling to me since that huge block of money is required to operate a 2004 Ford Focus which costs about twenty cents a mile to operate. This money was 49% Service and 46% gas. The rest went to parking and other random expenses. I am making a conscience decision to spend as much money on [La Habra](http://www.reddit.com/r/LaHabraCA/) Boulevard as is reasonable since my housing value is directly tied to how much that area can be improved. The bulk of spending at 76 went to a run down little gas station there. The percentage of my spending on housing and transportation is concerning. This is particularly true since I only owned the home half the year so next year will be even more expensive. I spent 37% of my income on housing, and 14% on transportation. So 51% of my income I have little direct control over. The only real surprise there is how much less I spent at Amazon, and how much more I spent at Target compared to in 2012. I expect those numbers to be reversed this upcoming year since I no longer live within walking distance of a Target. Lowes of course came up so high because of spending on the new house.